Liberty Trees, the last survivors of the Revolution - Aged Woods, Inc.
Thomas Jefferson once said “the tree of liberty must be refreshed from time to time with the blood of patriots and tyrants.” The Liberty Tree in Boston was a prominent symbol for the Patriots and the cutting down of the tree by the British did as much to strengthen the Patriot cause as any other act. 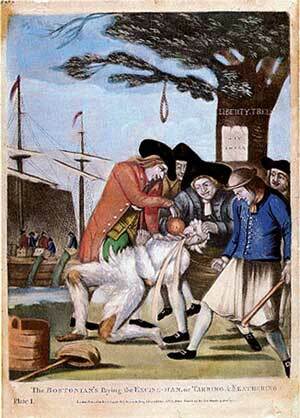 Liberty Trees began to pop up all over the colonies and towns and a few even lived into the 20th century. One of the last surviving Liberty Trees was on the St. John’s College campus in Annapolis, Maryland. The tulip poplar died in 1999 when Hurricane Floyd brought it down. The tree was near and dear to the students and professors and the tree played an important role in graduation ceremonies. The 400 year old tree was then used as reclaimed wood to make guitars. Perhaps the last remaining Liberty Tree is in Randolph, New Jersey, a white oak tree dating to 1720. The white oak is struggling to stay standing and it appears that the end will come sooner rather than later. Despite that the tree still produces acorns and an attempt is underway to replant its offspring. Another tree in New Jersey, this one in Bernards, was cut down in April 2017 at around 600 years of age. George Washington and the Marquis de Lafayette once picnicked underneath the tree. The idea of the Liberty Tree also reached Europe where the Arbres de la libertè became a symbol of the French Revolution. Liberty trees were also planted in Amsterdam to help symbolize the alliance between France and the Batavian Republic. One Liberty Tree, an elm planted in 1790, still survives in La Madeleine at Faycelles in southwestern France. In Italy , another elm was planted to celebrate the Parthenopean Republic. This tree was planted in Montepaone, Calabria and stood until 2008 when it was damaged beyond repair by a storm.